If you’re committed to providing your family nutritional, low-sugar snacks, you’re not only helping their physical well-being but their dental health too. If you have school-age children, though, you might be concerned about other snacks available to them while away from home. To begin with, any potential problems at school with available snack items might not be as bad as you think. A few years ago the U.S. Department of Agriculture (USDA) established new snacking guidelines for public schools. 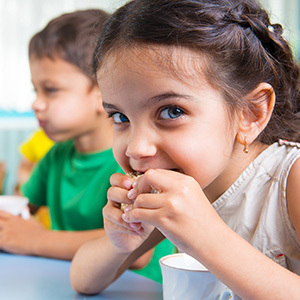 Known as the Smart Snacks in Schools initiative, the new guidelines require schools to only allow snacks sold on school grounds that meet minimum nutritional standards. In addition, these guidelines promote whole grains, fruits, vegetables and low-fat dairy products. Still, the guideline standards are only a minimum, which could leave plenty of room for snacks that don’t meet your nutritional expectations. And school-offered snacks aren’t the only ones available on campus: there are also those brought by other students, which often get swapped around. The latter represent tempting opportunities for your child to consume snacks that aren’t the best for dental health. But there are things you can do to minimize the lure of these poor snacking opportunities at school. First and foremost is to educate your child on why some snacks are better for them than others. In other words, make nutrition an instilled family value—and, of course, practice what you preach. You can also send them with snacks you deem better for them than what’s available at school. Of course, you’ll be competing with a lot of exciting and enticing snacks, so try to inject a little “pizzazz” into yours like a dusting of cinnamon or a little parmesan cheese on popcorn. And use a little creativity (even getting your kids involved) to make snack choices fun, like using cookie-cutters to shape whole-grain bread and cheese into shapes. And consider getting involved with other parents to encourage school administrators to adopt stricter snack standards over and above the Smart Snacks in Schools initiative. This not only may improve the nutritional content of available snacks, but also transform a “family value” into a community-wide appreciation for snacks that promote healthy teeth and gums.